I made this card for my mom recently, not for Mother's Day, but just because I love her and she is so special to me. I used the stamp set from Ink On 3 called Pansies and I made it into a shaker card. This Pansies stamp set also has coordinating die cuts. Hey everyone! Kelli here again to share this cute beaver card I made using Ink on 3's Platy-rific Pondies Stamps and Dies! I colored the little beaver with Copics and same for his balloons. Then I added Glossy Accents to the balloons so they looked more dimensional. I also used real string for his balloon strings! 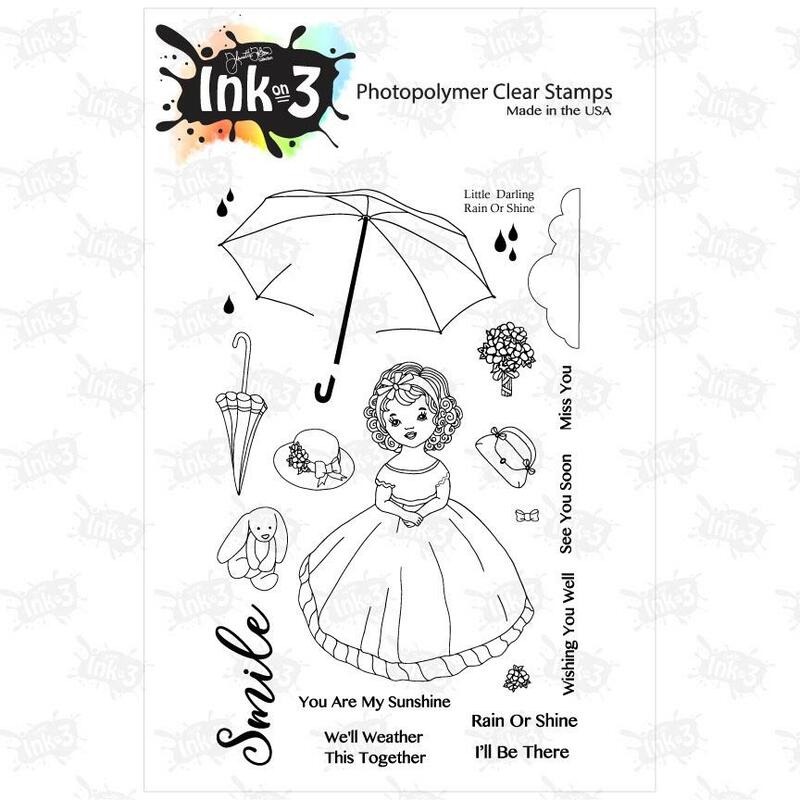 Hello everyone, Cheryl here today, with another idea using products from InkOn3. 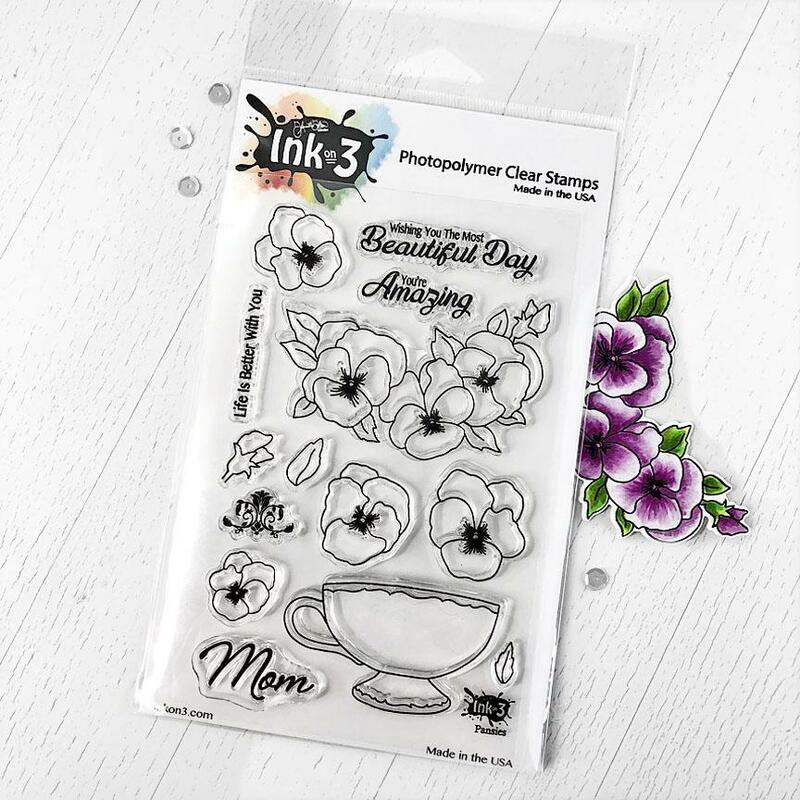 Today I'm using another great floral stamp set. I've always loved this one. It's called Posies. I like that you can build a vase of flowers or use the floral images alone. I chose to use them alone today. I stamped out an entire background using the three flower heads and the leaves with Blackout ink. I did a "messy" watercolor using my Jane Davenport Mermaid Markers...I love those things! I then took a soft blue and tried to get a sky looking background. However, it pulled in some of the green off the leaves. Oh well, it's soft and at least it's not stark white, lol. I then took a die from KatScrappiness and cut down the panel. I also pulled out a die from Simon Says Stamp that cuts that very thin gold frame. I then used the same die to cut it from gold cardstock. That same die set has this label die and also cuts a thin frame around it. I love when you remove the first thin frame and replace it with the gold one! You get this metallic bit and then the flowers continue on. Look kinda cool! 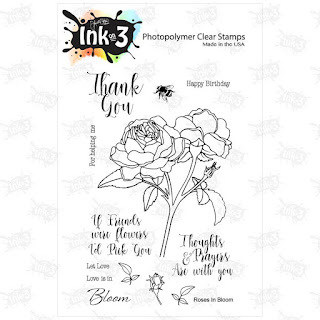 I stamped the sentiment that comes from the Roses In Bloom stamp set onto the label. I glued it to the card front and then added the thin gold frame that cuts along with it. I attached the entire panel to the front of a black A2 card base. I scattered around a few gems from Studio Katia to finish it off. I hope you like my "messy" coloring today. For me, it takes the stress out of it and you can just have fun and get some color down. Nothing to worry about when you go outside the lines, lol. Here's where you can get the supplies I used. So, there you have it. 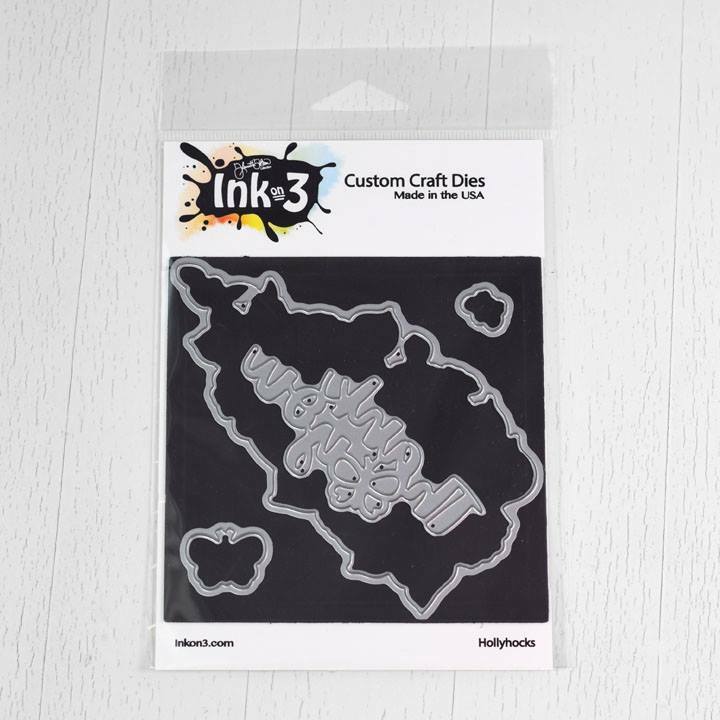 Head over to InkOn3 and shop around. I know you'll find lots of goodies. Hello Fleurette here and I am so excited to be a part of this awesome hop! This is Day 1. of a two day hop to celebrate the tenth 30 Day Coloring Challenge. 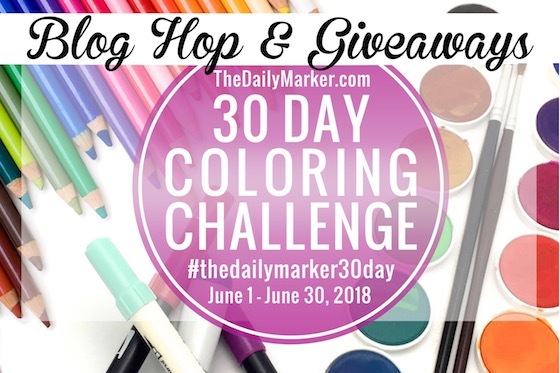 Have you heard of “The Daily Marker’s 30 Day Coloring Challenge” hosted by Kathy Racoosin? Right now it’s in the middle of the challenge and it’s a great time to take a leap, jump in and get your feet wet! Don’t feel like you are jumping into the middle of the challenge I hope you will think of it as a new beginning. Scroll down to see the lineup and where to hop next. As some of you may have heard we have an amazing, magical ink that we developed called Fadeout and it was specifically created for No Line Watercoloring, but it is also amazing for Copics, Pencils and other media as it is a detail, waterproof ink. 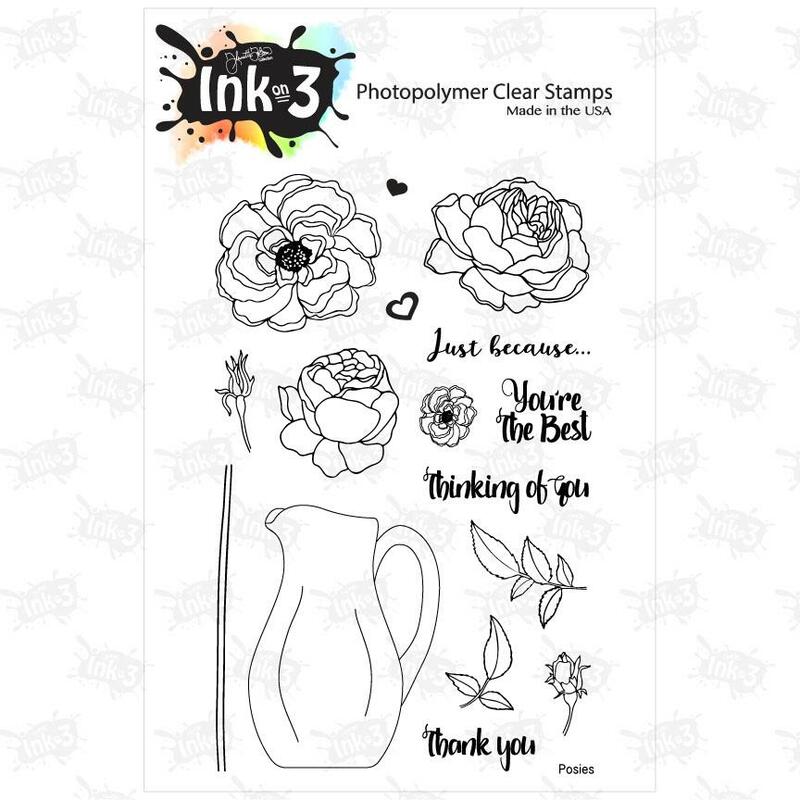 So that is where I started, I grabbed the Ink On 3 Fadeout ink and stamped it with the stamp set Roses In Bloom, as I love roses and I wanted to color some yellow ones. 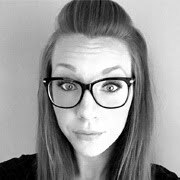 blog hop and new release! We will be giving away TWO, $25.00 gift codes to, two lucky winners! All you have to do to enter, is leave a comment on each stop on the hop. Giveaway will close June 20th at noon CST and winners will be posted on the Ink on 3 blog! 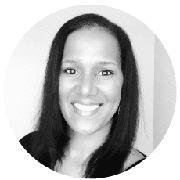 We are so honored to have the wonderful Lydia Fieldler joining us on this hop too! 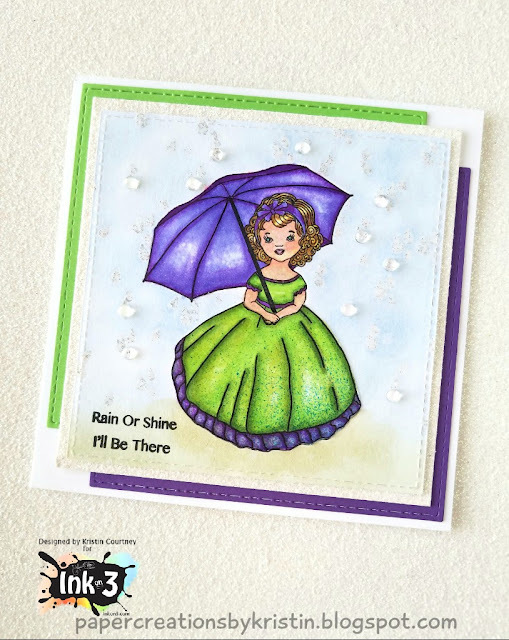 Check out our new release below, then scroll down to see the fun project I created to share with you, using the new Hollyhocks stamps and dies Available Now at Inkon3.com. Grab both and save 20% during the hop! Use the above link and you don't even need a coupon if both are in your cart. 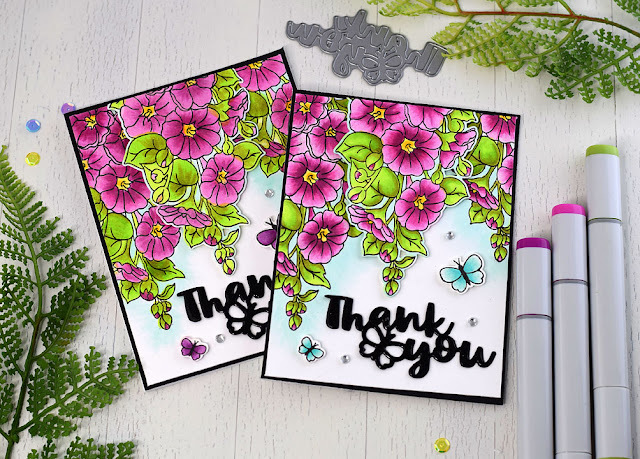 Hollyhocks Coordinating Die Cuts with Stand Alone Word Die "Thank You"
Fleurette here and I am so excited to have you here to hop along with us! I had so much fun creating this card. For my card I stamped the Hollyhocks Stamp different 3 times in Blackout Copic friendly waterproof detail ink, to create a hanging garden effect. The fist two I stamped directly onto some Neenah Solar White card stock, as colored them with Copics. The third time I stamped and cut out the image using the the coordinating Hollyhocks Die Cuts. So fun and easy! I also stamped and die cut the cute little butterflies. 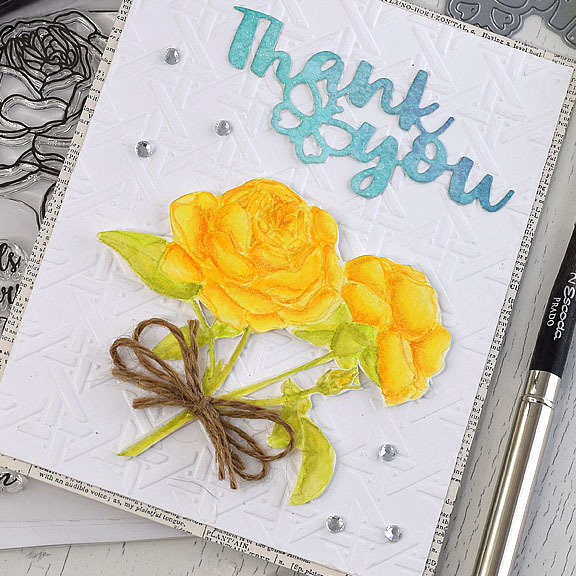 The "Thank You" was die cut with the stand alone word die that comes with the coordinating Hollyhocks Die Cuts. I cut out 4 of them to create some depth and coated them with some Glossy Accents to give them a glossy finish. I popped up the center die cut hollyhocks and the two butterflies with some foam tape, to give it extra dimension. Then added a touch of glitter to the flowers and butterflies with the Wink Of Stella glitter pen. I will list the Copic marker combinations I used at the bottom of this post. I had some extra fun while creating this card as I had a friend over who really wanted to learn how to make a card and also wanted to learn how to shade with Copics, I was amazed at how well she did, especially since it was her first time ever using Copic markers! So, my card was actually created during a teaching session. So fun! She did such an amazing job, I bet you will have a really hard time figuring out which I did and which she did :D Below are the two card side by side. How to Youtube video to come. 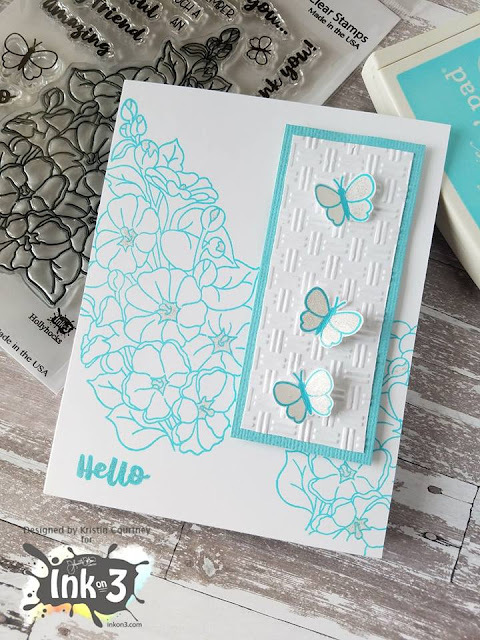 This week for my Design Team project, I am sharing a card I made using the new stamps and dies called Hollyhocks. It also has a coordinating die set. My card is simple but pretty. I accented the butterflies and parts of the flowers with my glitter pen and only stamped the images in one color. The butterflies are popped out just a bit by bending the wings up and gluing onto an embossed background. I hope you enjoyed the sneak peek! Have a great day! 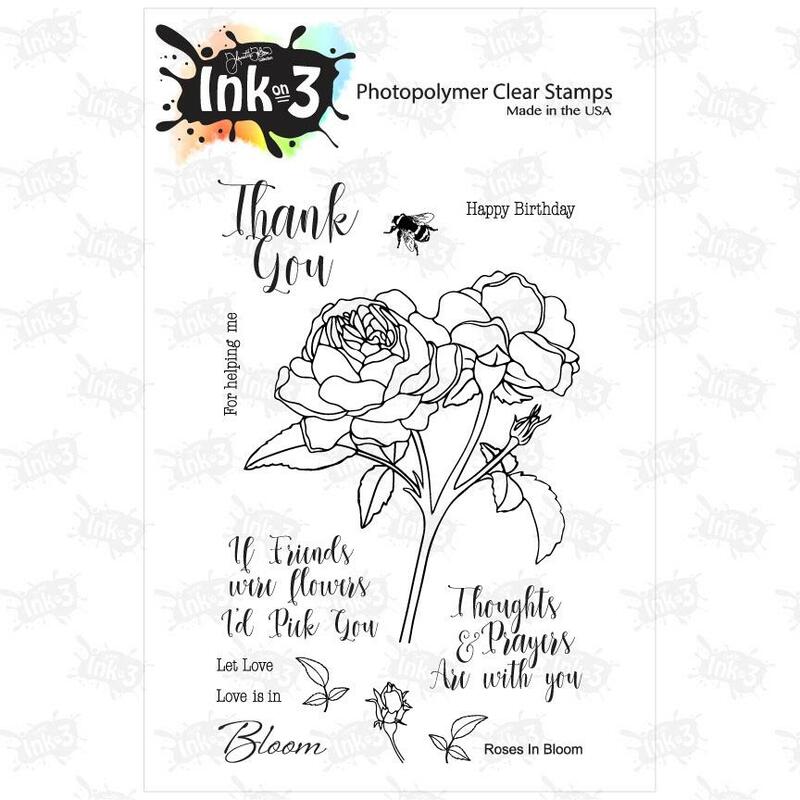 This week the Ink On 3 Design team has been sharing some card previews of the new Hollyhocks Stamp and Die Set that is coming out June 14th! 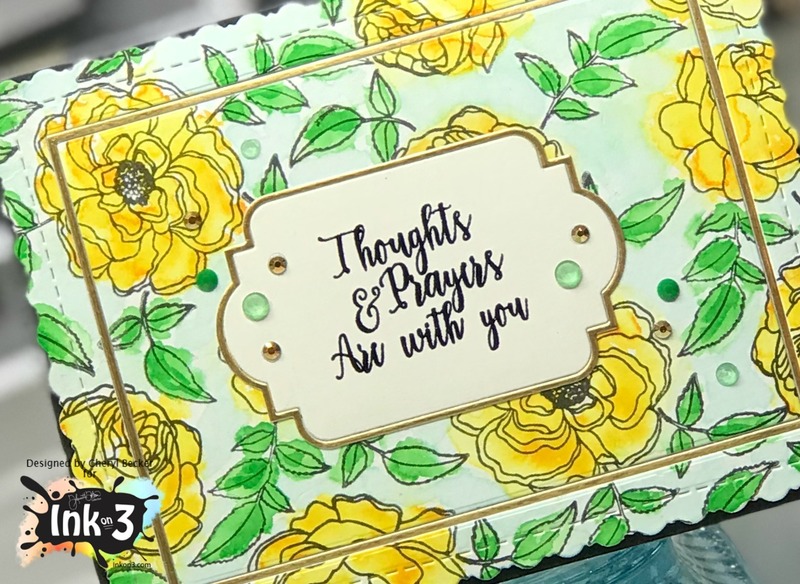 To color in this card, I first stamped the image using Fadeout ink and then loosely colored in the image using Mijello Mission Gold Watercolors. 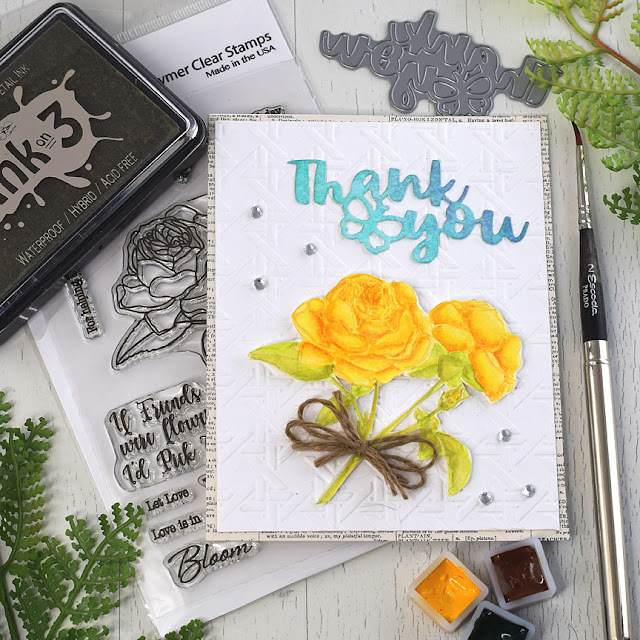 The Thank you die comes as a stand-alone die along with the coordinating die set. All I did to it was snip the little butterfly that is attached and added glossy accents to finish it off. To complete the card, I used the "you are amazing" sentiments and stamped them out using Blackout Ink. And there you have it, a beautiful no line Hollyhock thank you card! Hey everyone! Kelli here with a preview of the Hollyhock Stamp and Die set that is coming out on June 14th! Can't wait! I also just planted some hollyhocks in our backyard so I hope they start growing soon! So I used the new Hollyhock Stamp set from the online store and colored them in with Prismacolor Colored Pencils. The stamped sentiment is also from the Hollyhock set. To add some dimension to the background, I used texture paste and a stencil. I love doing this because it adds just a little bit more interest and since those flowers are so beautiful, I didn't want to do anything to take away from them! Just remember, the stamp set comes out on the 14th! Don't forget to stop by! 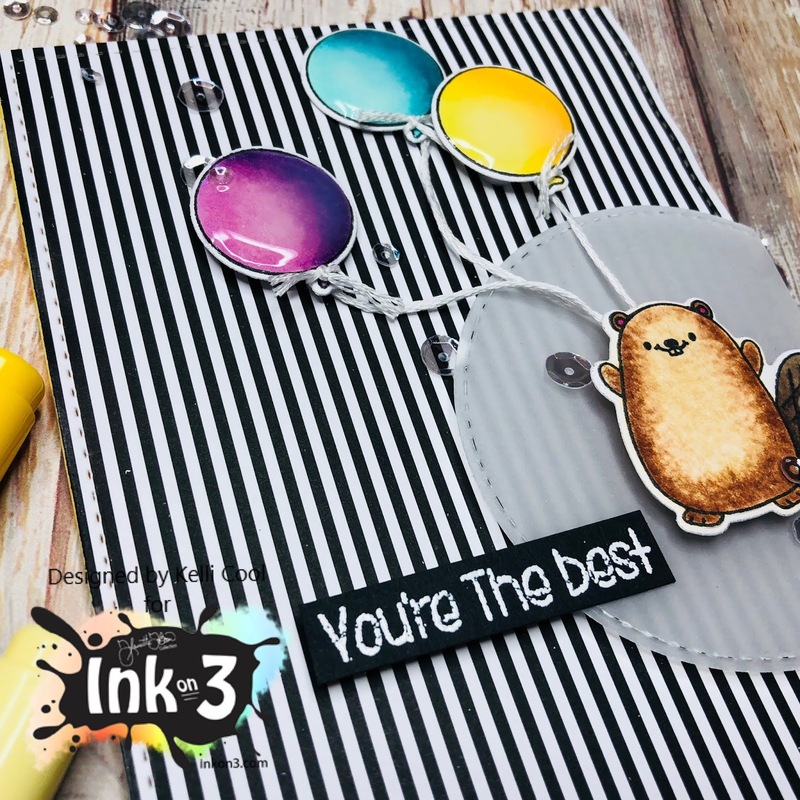 Hi my crafty friends, Cheryl here, for InkOn3. Yippee!!! 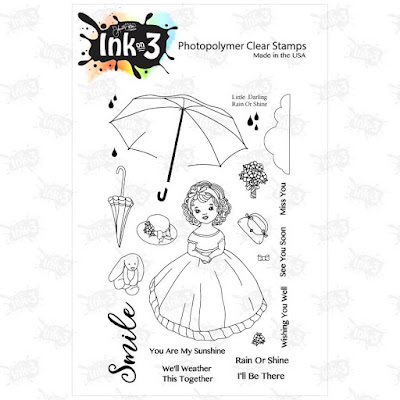 It's time for a new release from InkOn3. And it's a beautiful one, at that! Who doesn't love a great floral stamp? And who doesn't love hollyhocks? So, here you go! Isn't that so pretty? And how great to have coordinating dies!!! And so many beautiful sentiments and a very pretty font. I love this set! So let me show you my first card I made using it. I started off by picking this beautiful background I made using alcohol inks on Yupo paper. Before it was totally dry, you have these "sticky" areas. Take your foil and press it on, rubbing firmly. When you pull it off, some stays stuck and you get these bits of shiny foil left behind. It's so fun to do! I took the hollyhock stamp and inked it up with Juicy ink and embossed with golf embossing powder. I left it just like that! Well, I brushed it all over with my Wink of Stella glitter brush marker. I think by leaving it uncolored, it works perfectly with the colorful background. I then took the Thank You die and cut it from gold foil cardstock and a piece of white fun foam. I cut a second one from a scrap of Yupo paper to get the green butterfly. I carefully trimmed it out and glued it in place over the gold foil one. I adhered it to another scrap of Yupo done in that pretty aqua green color. To assemble the card, I added the hollyhock using foam tape. I added foam tape just to the sides of the aqua strip and used liquid glue where it would go over the hollyhock. I then pulled out some clear acrylic bubbles and scattered a few around. I love how they look like water droplets. I added the entire panel to the front of an A2 card base of heavy weight cardstock. And that's it. I think it came out so nice and I love the colors! I love the simplicity of the gold embossed hollyhock. It just works for this card. Here's where you can find the things I used. So, be sure to watch all week for some amazing sneak peaks from the design team. And the release goes live next week! Get out your crafty "toys" and have fun playing! Hello and Happy Wednesday! 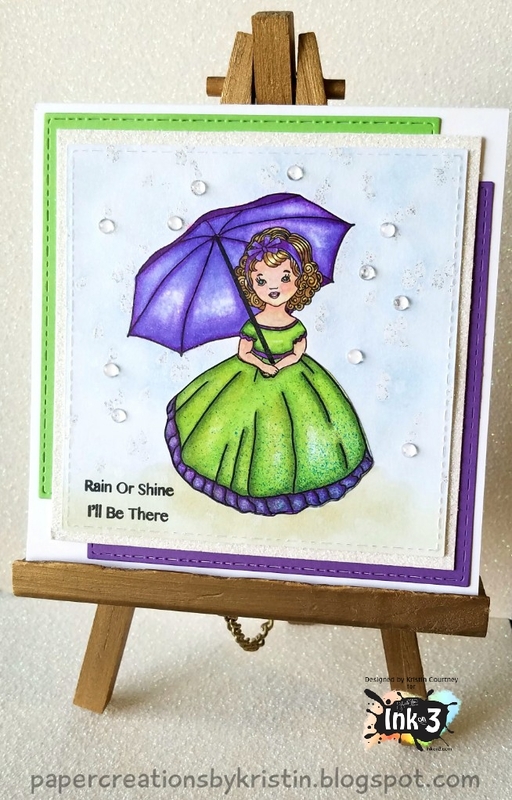 For my Ink On 3 design team project today, I am sharing a card I made using the Rain or Shine~Little Darlings stamp set. This is such a pretty and versatile stamp set. The new Blackout Detail Ink is wonderful and a must have. I used my Spectrum Noir markers to color this in. I am pretty new to coloring in stamped images, but I liked how this turned out. I stamped the raindrops in the background using the Juicy Clear Embossing & Watermark Ink pad and embossed with glitter embossing powder. I added the glass drops for added dimension. Hey y'all! 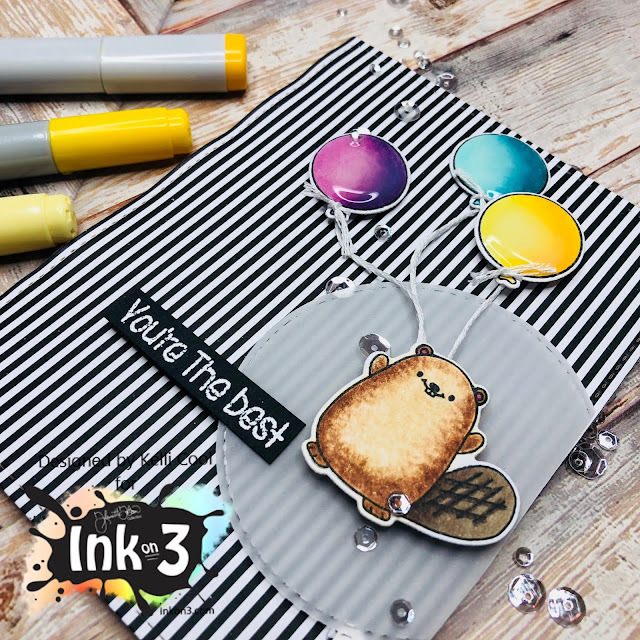 I'm so excited because today is my first card to post being on the Ink on 3 Design Team! For this card, I decided to use the Ink on 3 Pansy Stamp Set. First, I embossed using the Ink on 3 Juicy Clear Embossing Ink and white embossing powder onto white watercolor paper. Y'all have to use this embossing ink! Works perfectly. After heating up the powder and letting it cool off, I just sprayed some Dylusions Shimmer Spray on to my craft mat and painted it on the watercolor paper! Hey there, crafty friends! Cheryl, here today. 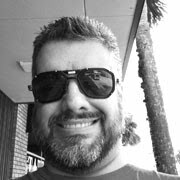 Welcome to the blog and a new project for InkOn3 Design Team. I pulled out my notebook of card sketches because I had no ideas. I love that I have a resource to go to when I'm stuck, lol. So anyway, this is what I came up with. I started by creating a watercolor background of pinks, yellows, and orange. Then I picked the areas I liked best for my florals. 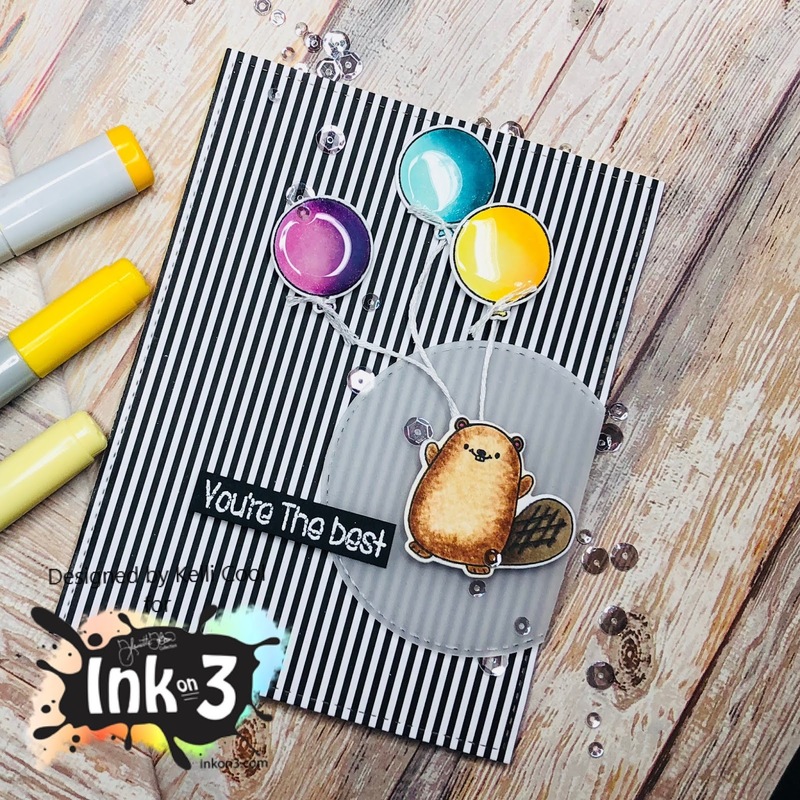 I stamped in InkOn3's Juicy ink and embossed with white embossing powder. Fussy cut them out and set aside. I then pulled out some dies from my stash. I chose a scalloped oval and a regular oval from Spellbinders. The pink scalloped layer is cut from glitter paper and the top layer is from white. I then chose some fun and bright patterned papers and created the strip on the left. The watercolor look paper is from a Lawn Fawn paper pad. I tied a ribbon on the strip and after adhering down the watercolor piece, I added the strip with foam tape. I then added the oval piece with foam tape on the right side and liquid glue on the left. I added the flowers with foam taped as well. I tucked the leaves in place and glued down with liquid glue. After cutting some banner strips, I stamped my sentiment with InkOn3 Blackout ink. I love how black and crisp this ink stamps! I also added a banner strip of the same glitter paper and added with foam tape. I picked out some confetti sequins by Studio Katia and scattered a few around. So, there you have it. A fun Spring/Summer card. If you ever find yourself stuck, look for some sketches that might help you out. It does me! Here's the products I used. Today I'm sharing this super easy and fun to make card featuring the Lilac Dreams set from Ink On 3. At first, I was going to do a no line coloring for this card and then changed my mind when I realized I wasn't going to have the time to finish it. I've been wanting to try this technique out for a while and I am so happy I did because I love the results! 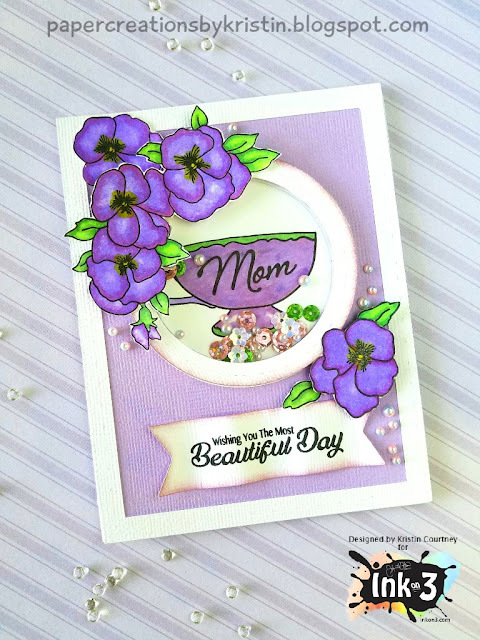 I first began by stamping out the lilacs onto the cardstock using Juicy Ink, then heat set the images using a fine white embossing powder. I then smeared some Seedless Preserve and Wilted Violet Oxide ink onto clear acetate sheet, sprayed it with some water then used the sheet to smoosh onto the cardstock, using my heat gun to dry every layer. I repeated that process a few times until I was satisfied with the coverage. Then I spritzed the entire panel with water and soaked up the droplets with a paper towel, which left behind some watermarks. Next, I used a detail watercolor brush and added more distress oxide ink to the flowers using the same colors as the background. Then to the leaves added a mix of Forest Moss, Evergreen Bough, and Lucky Clover Oxide Ink. I finished the card by adding a sentiment from the Water Lily set to a piece of vellum which I wrapped around the card front and embellished it with some green crystals.